To most people, salads mean "healthy," and that's it. 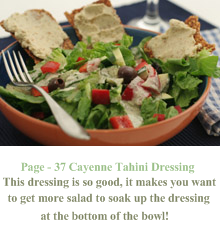 But this recipe book introduces you to a world of salads and dressings that taste so good, you'd be willing to have them as your main course! Great salads are all about the dressing, and these dressing recipes will make it so easy for you to introduce more vegetables into your diet, that you won't even need to think about the dramatic health benefits. You'll just be thinking about how good they taste!